Estate planning is smart for everyone, without exception. No matter how wealthy or poor, everyone has an estate. Many people falsely assume that, because they are not wealthy, they do not need an estate plan. This could not be further from the truth. A recent article discusses why estate planning is essential for everyone. The essential function of estate planning is to dictate exactly how you would like to distribute your assets after your death. After working your entire life to acquire the assets within your estate, it is only logical that you should take advantage of this opportunity. If you die without an estate plan in place, the state will distribute your assets for you. The primary methods of transferring assets upon death include wills, living trusts, joint tenancy, and community property. Perhaps the most commonly known form is a will. 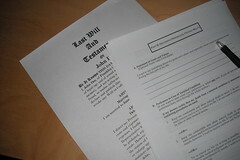 A will is simply a written and signed document that explains how a person’s property will be transferred upon death. In order to administer a will, a process called probate is necessary. A living trust is another device through which people can transfer assets upon death, however probate is unnecessary for such transfers to take place. Upon your death, indicated assets will be transferred to a trustee, who then manages and distributes the funds based on your instructions.